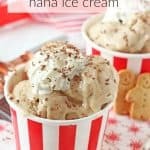 A delicious dairy, gluten and refined sugar free festive Gingerbread Ice Cream. The perfect snack for the Christmas season! Cut the bananas into slices, place in a freezer bag and freeze for 6-7 hours or overnight. Put the bananas into a food processor with a few small spoons of water and blitz until they have broken down to ice cream consistency. Add more water if required but be careful not to over-process. Add the nutmeg, ginger and cinnamon and blitz again for a few seconds. Serve immediately with whipped coconut cream and chocolate shavings or transfer into a dish and freeze to serve later.